‘Fury Rona’ Tier I Skin Reveal! 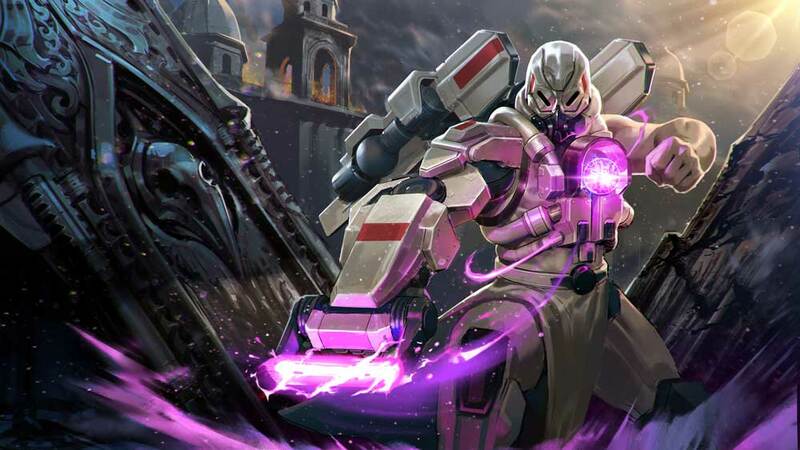 Stormlord Ardan’s heart is now powered by his daughter’s life-giving star, but that’s not all: This incredible Tier III skin features new plasma effects, heroic new animations, upgraded armor and his old power fist is now a powerful plasma cestus. Plus, the new Gauntlet visual effect will leave players’ mouths gaping. Read the new Stormlord Ardan lore here. Star Queen Celeste has invaded the Storm Queen’s palace. There, she discovered that her predecessor has already commissioned a crown, armor and staff for her. Liquid gold high tech meets regal fashion in this gorgeous Tier II skin. 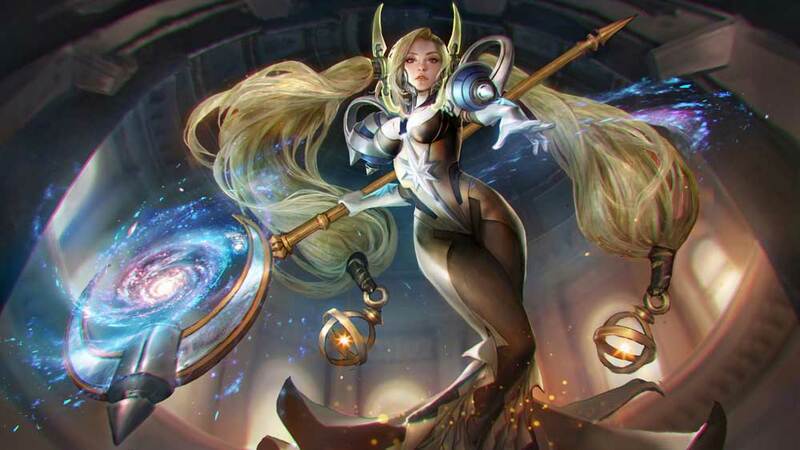 Read Star Queen Celeste’s lore here. For the first time ever, you can collect cards to unlock a limited-edition skin! 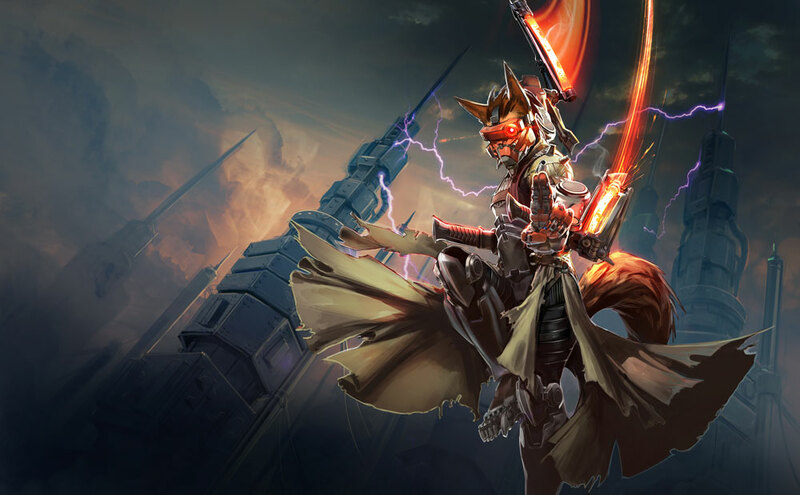 Night Shadow Taka has a completely new effects suite featuring molten metal blades. Unlock this limited-time skin with ICE or by collecting 16 “Night Shadow Taka” legendary cards. 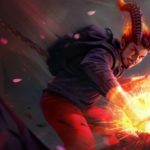 Taka card events will accelerate you toward the 16 legendaries you need. These card events will be similar to “Crazy 8” card events, except that after your third win of the day, you are guaranteed to get a Night Shadow Taka card. We’ll run a number of card events in the coming weeks. Keep a close eye on the in-game NEWS section for more details soon! A special card box in the Market will only contain Night Shadow Taka legendary cards to help you complete your collection. You may destroy unwanted cards and use the Essence to craft the Night Shadow Taka cards you need. As Winter Season winds down, we took special care to smooth any rough edges without too many major changes. We want this update to alleviate any pain but still feel familiar. Respawn timer clock refund per turret kill down from 15% to 10%. Jungle monsters strength now scales with team net gold rather than time in game. Spectator mode now displays which team scores the last hit on jungle monsters. Bug fix: Perk is now activated as long as Krul is idle in a bush for 1.5 seconds. Bug fix: Fix cases where perk did not activate when it should have. Damage from 150-200-250-300-530 + 70% crystal ratio + 100% weapon ratio to 160% basic attack + 70% CR. Barrier up from 80-160-240-320-600 + 75% CR to 100-200-300-400-600 + 125% CR. Damage per stack changed from 16-34-52-70-110 + 10% CR to 20-35-50-65-95 + 20% CR. Base heal changed from 36-48-60-72-164 to 40-60-80-100-140. Heal per stack changed from 12-17-22-27-47 + 10% CR to 15-20-25-30-40 + 20% CR. No longer reduces target’s crystal power or attack speed by 10% per stack. Instead, weakness generally reduces a hero’s damage output by 6.25% per stack (50% at 8 stacks). Stun duration changed from 2-2-2 to 1.8-2.0-2.2 seconds. Wolves have 300-450-600 health, 150 armor, 150 shield plus 20% of Fortress’ bonus defensive stats. Wolves are affected normally by all damage types. Basic attacks always deal strictly 1/3 of a wolf’s health. Fortress’ health gained from 250-550-850 to 250-450-650. Health up from 60-110-160-210-310 + 15% CR to 110-200-290-380-560 + 30% CR. Armor & shield down from 120-125-130-135-145 + 12% CR to 20-25-30-35-45 + 5% CR. Damage up from 7-15-23-31-47 to 8-16-24-32-48. Activation amplifies weapon power by 8-12-16-20-24% and crystal power by 15-20-25-30-35% for 4 seconds. Cooldown up from 8-7-6-5-3 to 10-9-8-7-5. Activating this ability no longer resets Vox’s basic-attack cooldown. The hitbox of this ability was slightly modified to match how it looks in game. Energy cost down from 32-50-68-86-104 to 30-45-60-75-90. Energy cost up from 30-38-46-54-70 to 50-60-70-80-90. Bonus attack speed down at earlier ranks from 55-64-73-82-100% to 50-60-70-80-100%. Cooldown up from 12-11.5-11-10.5-10 to 14-13-12-11-10. Cooldown up from 15-14-13-12-11 to 16-15-14-13-12. Twirly Death stack duration down from infinite to 10 seconds. Energy cost up from 36-44-52-60-78 to 40-50-60-70-80. Initial damage up from 60-70-80-90-110 to 80-110-140-170-200. Delayed damage up from 120-140-160-180-220 to 120-160-200-240-280. Center crystal ratio down from 240% to 160%. Edge crystal ratio down from 160% to 100%. Damage per basic attack up from 70% to 75%. No longer generates Bloodrage when you land on enemy heroes. Weapon ratio increased to match her perk from 70% to 75%. Fixed a bug that was lowering the damage of the second activation the more Fury that was consumed. Correctly generates fortified health every second during Red Mist. Reduced Fortified Health generated from this ability down from 50-75-100 to 35-50-65. Level 1 health up from 881 to 960. Damage up from 60-90-120-150-350 to 60-120-180-240-360. Fortified health duration up from 3-3-3-3-3 to 3-3-3-3-4. Pull distance up from 25-25-25-25-35% to 30-30-30-30-30%. Corrected the arrow hitbox to match the visual effect. Reload time returned from 4.0 to 3.3 seconds. Trap damage up from 80-130-180-230-280 + 180% CR to 120-180-240-300-420 + 220% CR. Heal per second up from 40-45-50-55-85 to 40-50-60-70-100. Taka’s X-Retsu no longer skips the wind-up animation. Dragon Breath damage up from 550-875-1200 to 650-925-1200. Core Collapse cooldown down from 24-22-20-18-10 to 16-15-14-13-10. Clarification: All damage from this ability can critically strike. However, only the primary target suffers basic-attack effects. Heal per enemy hit up from 15-24-33-42-51 (4-6-8-10-12 against non-heroes) to 15-25-35-45-55 (30% of that against non-heroes). Burst heal changed from 55-70-85-100-130 + 80% CR to 60-80-100-120-160 + 65% CR. Base armor and shield changed from 20-64 to 8-76 at level 1-12. Total cost up from 2400 gold to 2600. The most prominent news is now displayed on the app home screen. A quick new survey will sometimes ask you how a match went. We’ll use your feedback to further improve the Matchmaker. Heroes in certain conditions will path more efficiently to targets. Ability overlays can be dismissed while silenced. Go try out the new 1.15 balance changes and enjoy the amazing new skins!